Extracts the intensity features from segmented image mask and gray scale image. names ImageList Optional A directory with the original image files, for naming the table. If omitted, names from "mask" are used. masklist MaskList Optional A MaskList source for the objects. If given, the mask input is not used for objects, but must be given for file names. edges ImageList A directory with BW mask image files with the erosion mask edge. 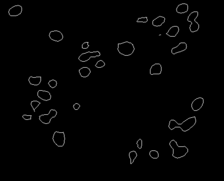 erodeWidth float 0 Erosion width to calculate margination in pixels or percentage of object length. Erosion width can be negative, which means the object will be dilated. isRatio boolean false Eroding width is expressed in percentage of object width instead absolute pixels. percentile float 1 Percentile to read from object intensities. Value 1 equals 1% and 99% will be measured as Low %1 and High 1%. prefix string "" Prefix string for data headers in the result table. Used when reading the same images with multiple parameters and then joining the results.